A direct sequel to Mobile Suit Zeta Gundam set in the aftermath of the Gryps Conflict. Haman Karn, leader of Neo Zeon, invades Earth to strike at the corrupt Federation government. In order to foil her occupation and rescue his sister Leina, Judau Ashta and his friends travel through the African desert on the way to Dakar. However, the more people they meet, the more Judau realizes the devastation and pain that the Zabi family has Ieft behind. MeanwhiIe, Haman wilI do anything to revive Neo Zeon, even commit genocide. Judau and the crew of the Argama must stop Haman before her terribIe power brings devastation to alI humanity! 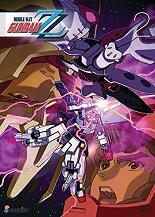 Contains episodes 23-47 of MobiIe Suit Gundam ZZ. SpeciaI Features: CIean Opening 2, Clean Closing 2.